EDINBURG — Hidalgo County commissioners might be back at square one in terms of negotiating a contract with a program manager for the new courthouse, but they come to the table with more knowledge and a better understanding of their expectations, they said Thursday. Contract negotiations between the county and Jacobs Program Management Company began Thursday morning — exactly two weeks after the county’s first-choice firm was raided by FBI agents. The statewide raids surrounding Dannenbaum Engineering Corp. threw county officials off-guard and caused another round of delays after they chose to officially cut ties with the firm last week. Commissioners met with representatives from Jacobs for an hour-long workshop Thursday, where they realized the scope of work that was originally called for in October has since grown to encompass other special services. 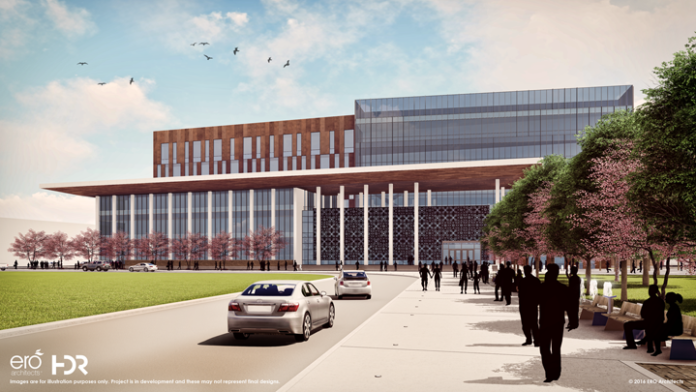 The Dallas-based firm submitted a one-page proposal Wednesday evening that shows a four-year execution plan and schedule for the project. But the proposal fell short when compared to the detailed plan Dannenbaum had developed, and failed to include other special services commissioners expect to obtain from the program manager. Those services, however, were not included in their original call for services. A courthouse is not a typical facility and requires a higher degree of specialized systems. “It’s a daily jail, so there are a lot of elements that come with that, that your normal buildings won’t have,” Palacios said. County employees must also be taught how to use them, repair them or know when to outsource services for those special systems, such as metal detectors and other security safeguards in place. Firm representatives said they will go back and make the necessary adjustments to their scope of work before they can begin talking about numbers and percentages. Jacobs’ initial proposal asked for a 4.38 percent fee of total construction costs. That is a number that is higher than Dannenbaum’s last proposal and higher than commissioners said they want to pay for the services. Despite that, County Judge Ramon Garcia remained optimistic about the meeting. “Frankly, I think we’re better off,” he said about starting the negotiation process over again. “Having gone through that initial experience gives us a better understanding of what we need going into this second phase.